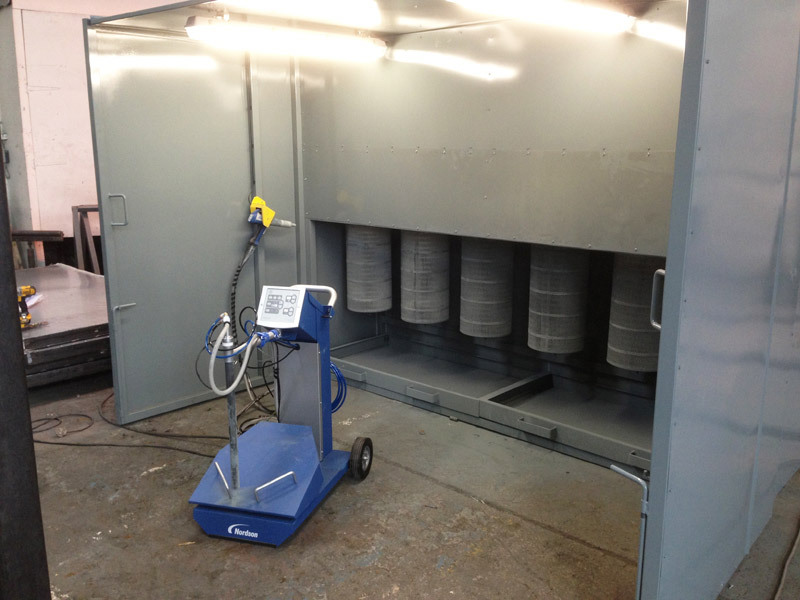 Our cartridge spray booth is designed to capture excess powder during application. It is the culmination of many years experience in designing and building machinery for powder coaters. 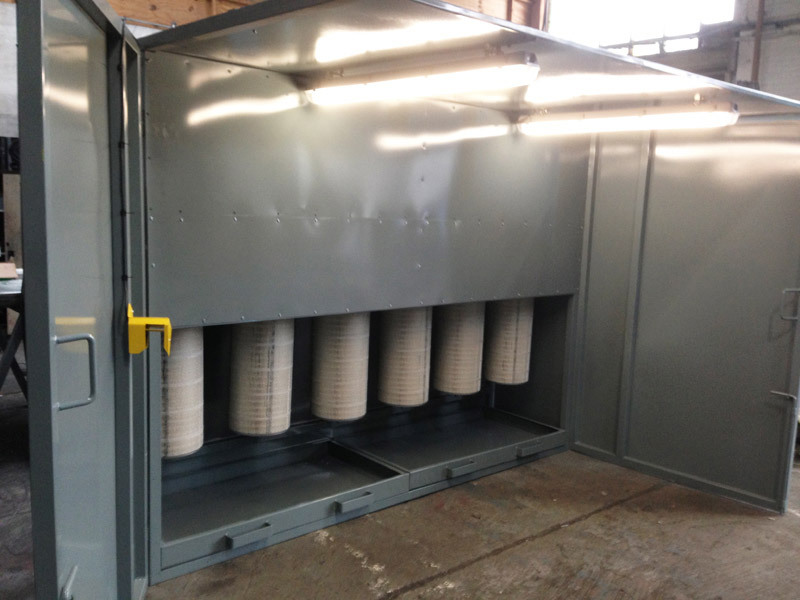 To comply with recent changes in legislation we have now upgraded our cartridge booth by fitting two centrifugal fans of 4kw capacity and six cartridge filters. Insurance companies now require that spray booths comply with the new guidelines issued by the Health and Safety Executive. This means that the suction must equal 0.7M3 per second, per M2 of the spray booth face. In all of our tests we have not found it possible to achieve this using any less than 2 4kw centrifugal fans and 6 cartridge filters in a 3M wide booth. 100% filtration means that the air filtration system does not require ducting to the outside. This makes installation easier and also increases overall energy efficiency, as you don’t lose heated factory air. Unlike water back booths, there is no ongoing expense of sludge removal. The filtered powder is collected in a tray, making disposal easy. Centrifugal fans used to remove contaminated air, more powerful than axial fans. Large, quick acting air valves direct a blast of air into each filter at intervals of 30 seconds to keep them working efficiently. Complete with roof and interior lighting. Option of auto-switch – when the powder gun is taken from the holster the fan automatically switches on, replace and it goes off. This device can substantially reduce energy consumption. Completely manufactured at our UK workshop. 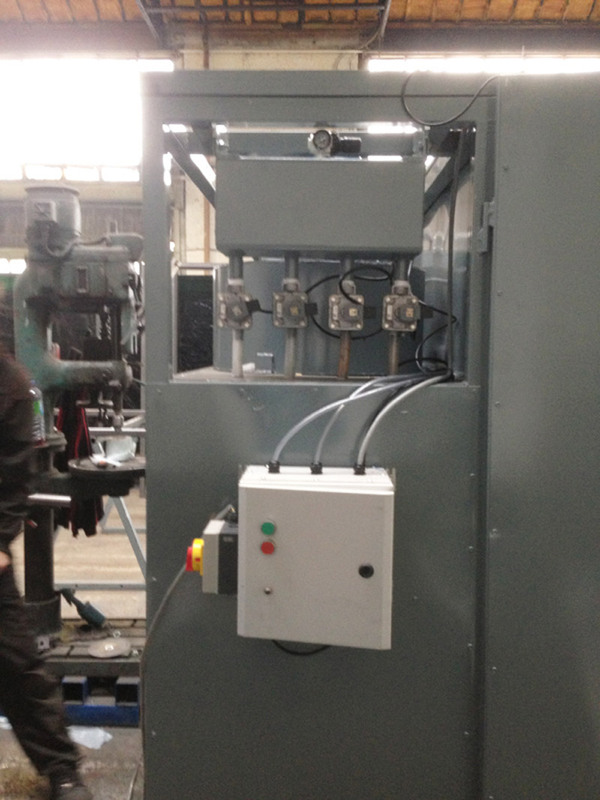 Our machinery is manufactured to a high quality and is built to last. Flat packed for easy transportation and installation. Full compliance with HSE guidelines. We can also make custom sizes, please get in touch to discuss your requirements. Infra-red detection device built into the holster for the powder gun. The auto-switch shuts off the booth when the gun is housed and switches it on when the gun is taken out of the holster. 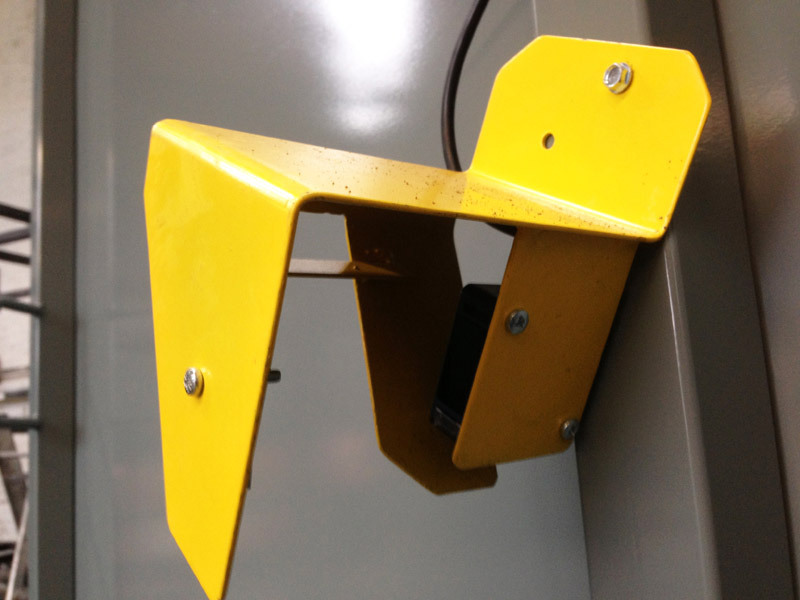 This device makes big savings in power and also reduces the noise coming from your spraying area. A track system is easily fitted to link your spray booth to one of our ovens. Depending on your individual circumstances, these may be either single runners or flight bars and we can supply them in a range of lengths. 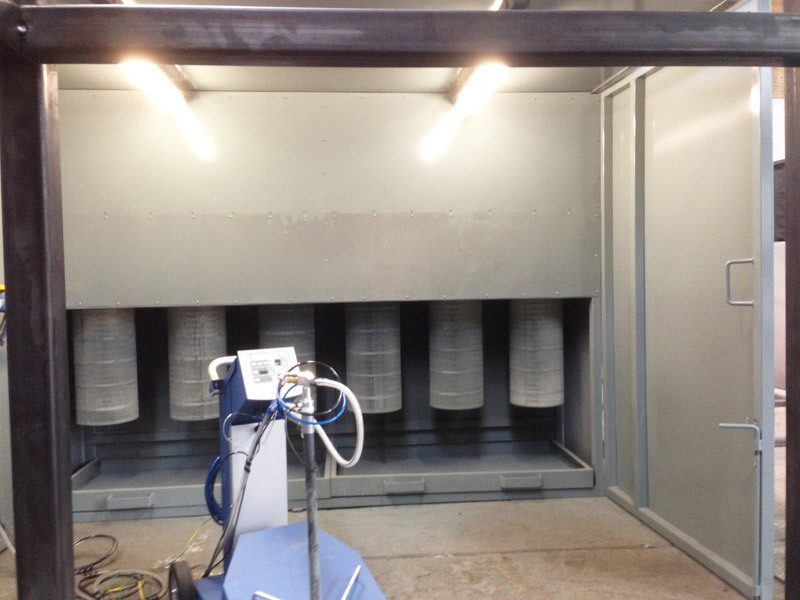 Silencers reduce the noise from our spray booths by 10 decibels. A 2 meter booth requires 1 silencer, a 3 meter booth requires 2 silencers. Please note that this spray booth requires compressed air to function correctly. 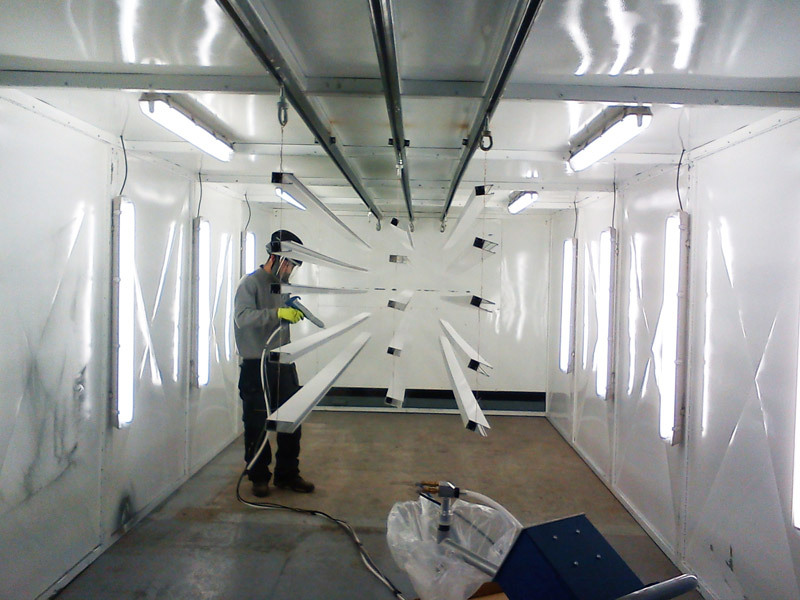 We can arrange for our spray booths to be shipped worldwide; we charge for shipping at cost. Our paint spray booths are available to view in our manufacturing premises in Glossop – SK13 6LG (10 miles South East of Manchester – 5 minutes from the end of the M67). We can also supply replacement cartridge filters for £69 each, our 2 meter spray booth requires 4 filters and our 3 meter spray booth requires 6 filters.